Uncommitted voters named Barack Obama as the winner of the third and final presidential debate by a large margin, according to a CBS News/Knowledge Networks poll. Obama was also named by uncommitted voters in this poll to have defeated John McCain in the first two presidential debates. Immediately after the debate, CBS News interviewed a nationally representative sample of 638 debate watchers assembled by Knowledge Networks who were "uncommitted voters" - either undecided about who to vote for or who could still change their minds. Fifty-three percent said Obama won the debate, 22 percent said McCain won and another 25 percent thought it was a tie. Democrats are usually perceived as better than Republicans at handling health care (a topic discussed in detail during the debate) -- and that was true for Obama. Before the debate, 61 percent of uncommitted voters said that Obama would make the right decisions about health care -- that rose to 68 percent after the debate. Only 27 percent thought McCain would do so before the debate -- afterwards it was just 30 percent. Despite McCain's observations that Obama's policies would raise taxes, half of these voters after the debate think McCain would raise taxes if elected. However even more, 64 percnet, think Obama would. The economy continues to be a critical issue for voters overall, and both before and after the debate more uncommitted debate watchers thought Obama more than McCain would make the right decisions on the economy. Before the debate, 54 percent said Obama would make the right decisions about the economy -- that rose to 65 percent after the debate. Thirty-eight percent said before the debate McCain would make the right decisions about the economy -- that increased to 48 percent after the debate. However, far more uncommitted debate watchers trust John McCain to handle a crisis. Before the debate, 78 percent trusted McCain to handle a crisis -- afterwards, 82 percent trust him. Obama's ratings were lower than McCain on that measure, but did rise after the debate from 50 percent to 63 percent. Far more uncommitted voters continue to think Obama understands their needs and problems than think that about McCain. Both before and after the debate, majorities of uncommitted voters felt Obama understood their needs and problems -- fewer said the same about McCain. Both candidates are viewed similarly on sharing voters' values, but Obama increased a bit more than McCain did after the debate. Forty-six of the uncommitted voters said that their image of Obama changed for the better as a result of this debate. Just 10 percent say their opinion of Obama got worse, and 44 percent reported no change in their opinions. McCain's image improved, but not nearly as much. Thirty percent said their image of him improved as a result of the debate, but nearly as many - 26 percent -- said their views of him are now worse than before. Debate watchers who thought Obama won the debate thought he was a better communicator and has a better grasp of the problems the country has to face. Some used words like "eloquent" and "confident" to describe him. In contrast, some said McCain was defensive and spent too much time attacking Obama - using words like "rude," "mean," and "caustic" to describe McCain's performance in the debate. Debate watchers who thought McCain won the debate were impressed by his experience, and many were unsure about Obama's sincerity and credibility. Many were also concerned that Obama's solutions all required spending money. As this poll has found after the previous debates, most uncommitted voters' minds have not changed. But more went Obama's way after this debate. 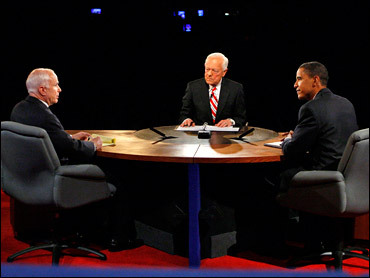 Thirty percent of uncommitted voters who watched this debate said they are now committed to Obama, twice as many as the 14 percent who said they are now committed to McCain. Most - 57 percent - remain uncommitted. This CBS News poll was conducted online by Knowledge Networks among a nationwide random sample of 638 uncommitted voters - voters who don't yet know who they will vote for, or who have chosen a candidate but may still change their minds - who have agreed to watch the debate. Knowledge Networks, a market and public policy research firm based in Menlo Park, CA, conducted the web poll among a sample of adult members of its panel, who are provided web access if they don't already have it. More technical information is available at http://www.knowledgenetworks.com/ganp/reviewer-info.html. This is a scientifically representative poll of uncommitted voters' reaction to the presidential debate. The margin of sampling error could be plus or minus 4 percentage points for results based on the entire sample.